(Merrell Publishers; 2007)The definitive history of the struggle to create and preserve this monumental icon of 20th century art; lavishly illustrated with updated research on the 1038 women represented in Judy Chicago’s masterpiece, now permanently housed in the Elizabeth A. Sackler Center for Feminist Art at the Brooklyn Museum. 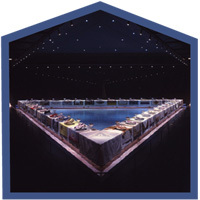 Narrated by Judy Chicago, this 40 minute visual walk around The Dinner Party, can be shown in its entirety or excerpted by teachers to allow students an in-depth examination of the art. Available for the first time through Pomegrante Publishers, this package of reproductions of the Heritage Panels (which include the 999 women of achievement whose names appear on the porcelain Heritage Floor) can be used as posters to provide historical information about women’s history to students of all ages. An array of full-color postcards illustrating plates, runners and details from The Dinner Party. Can be laminated for long-term use. An array of full-color posters and postcards illustrating plates, runners and details from The Dinner Party. Can be laminated for long-term use. Judy Chicago’s autobiography has become a classic in the literature of women and the arts. Through her struggles, both personal and professional, she has become one of the most influential, yet controversial female artists of our time. Ms. Chicago’s story will inspire any woman who has tried to find her way in an art world dominated by men. Twenty years after Through the Flower was first published, Judy Chicago again took up the story of her life and struggles as a woman artist in late 20th century America. In this, her second autobiography, Ms. Chicago takes ongoing issues of gender, power and the history of women, bringing to light myriad of difficult questions about art in our culture that remain unanswered even in this supposedly post-feminist era. Lessons in Feminist Art with Judy Chicago, an incisive look at Chicago’s teaching methods produced by WTIU, Television from Indiana University. The most comprehensive documentation of Chicago’s participatory art pedagogy, based upon a multimedia project in Pomona, California by Shirley Harlan and coordinated by Cheryl Bookout. CD features a variety of images from The Dinner Party for use on computers or projected display in the classroom to aid teachers using The Dinner Party Curriculum. Documentary about making The Dinner Party by Johanna Demetrakas.